This is a variation on the Medieval show. While some Medieval [ i.e. 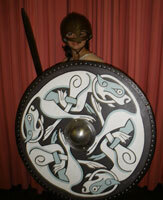 1000 AD to 1500 AD ] content is included the show also includes considerable information on the Vikings. 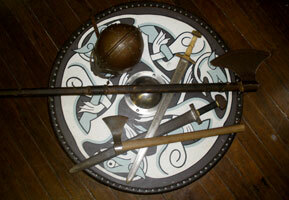 A detailed description of shield wall tactics particularly with regard to Viking innovations. Students will be needed to demonstrate said Tactics. A comprehensive look at the year 1066 including the Battles of Hastings, Stamford Bridge and Fulford Gate. Plus the unfortunate consequences for the Vikings. The social structure of the Vikings is also included covering Nobles [Jarls], Warriors [Huscarls], Peasants [Bondi] , Slaves [Thralls] and Weirdoes [Berserks]. Also mentioned is the surprisingly enlightened views of the Vikings towards Women's Rights, Hygiene and Medicine when compared to later Medieval Societies. My standard section on medieval law and order is included but also contains mention of the Vikings love of Trial by Combat, in all its 10 different flavors. Additional aspects my be included upon request. Student participation is a vital part of the show. All students are allowed to look at and handle my gear during a half time break provided I think the audience is suitable [approx. 1 in 100 are not] and the school approves.